Like most wild animals, deer will feast on almost anything you toss their way. After all, a steady diet of grass and leaves must get pretty boring. However, if you're in Colorado, you best not try to offload the uneaten half of your footlong Subway sandwich to nearby stags or does. 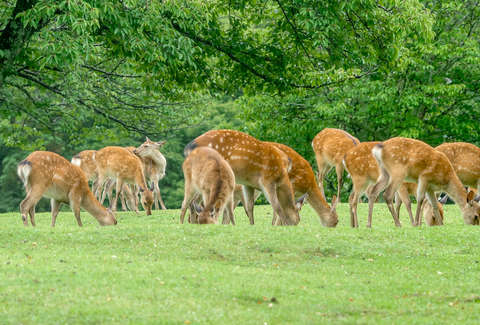 That's the word from Park and Wildlife officials in the state after Subway employees were spotted feeding a herd of ravenous deer leftover loaves of bread outside their restaurant, and subsequently caused quite a scene. The incident in question was caught on camera by a Dustin Schaefer, a resident of Georgetown, Colorado, who pulled into a local gas station only to notice that roughly 10 deer were milling about around the pumps, chowing down on loaves of bread, per a report from local affiliate KDVR. That's when he quickly noticed they weren't scrounging for it from the trash, but actually being fed by employees. "When I pulled my camera out to get a picture, a foot long hoagie went flying by me and he was chucking them Peyton Manning style," Schaefer said in an interview with KDVR, explaining that they kept throwing out more and more. However, the scene also caught the attention of the folks at Colorado Parks and Wildlife, who were less than thrilled to notice the gas station parking lot had turned into an impromptu petting zoo. An officer ended up talking to the overly generous employee and warned them that feeding the animals is dangerous and that if they kept it up they could face a fine of $50 or more. "It's not something we want to see. It's not good for the animal. Deer can also get very aggressive. It's their natural instinct because they have a lot of testosterone running through them right now and they're kind of revved up," Jason Clay, a spokesperson with Colorado Parks and Wildlife, said in a statement. It's also not good for their digestive system, and "can increase disease and stress," per the agency's website. So, next time you feel the urge, you'd be wise to refrain from gifting any wild four-legged friends your uneaten Honey Oat, or risk having to fork over a hefty sum, or worse yet, having an entire herd of carb-hungry macho dudes with antlers following you around.